Our teeth play an important role in our overall health and their care should not be overlooked. We want to help you maintain your natural teeth throughout your life. That’s why we offer a variety of other dental services here at ToothKind, for when you need more than just a checkup. Wisdom teeth are the large molars that emerge at the very back of your mouth, usually between the ages of 17 and 24. If there isn’t enough space for the teeth to grow they can become ‘impacted’ which is when problems start. Infection and inflammation can develop in and around the tissue covering the impacted tooth. You may notice swollen red gums, pain and jaw stiffness. Nearby teeth can also be affected by the inflammation of the gums and surrounding bone, or even decay if food is trapped between the teeth. In most cases, removal of the impacted teeth is the only permanent solution. Your dentist or oral surgeon will explain the process of wisdom teeth removal. It is important to tell your doctor your entire medical history, including medicines you are currently taking, any known surgery/anaesthesia related problems, or if you are prone to heavy bleeding. Your dentist will need to take some X-rays of your mouth prior to surgery. Usually the operation is done under local anaesthetic, which completely blocks pain from your teeth and gums while you stay awake. However, if the teeth are difficult to remove or you feel anxious about the procedure, general anaesthetic by a specialist oral surgeon may be your preferred option. In most cases wisdom teeth extractions are no different to extractions of any other teeth. The dentist will widen the tooth socket by using a straight instrument and a pair of dental forceps. The tooth will be moved until it is loose enough to be removed completely. In deeply impacted cases, the surgeon may make an incision in the gums or may remove some bone as well. The incision is closed with stitches, which may be dissolvable after ten days. The whole procedure can take between 30 and 60 minutes. Sometimes there can be some complications as with any extractions and the dentist will explain these to you before your treatment. After a wisdom tooth removal, you will need to rest. Painkillers will be recommended for up to a week after surgery. Bleeding after surgery is common, but your dentist will inform you on how to best manage this. Swelling of the jaw can sometimes also happen, but will subside after four to five days. Your dentist will advise of any possible complications, risks or side effects associated with wisdom teeth removal. If you have any concerns about your treatment, please call our lovely staff who can assist you. A study by the Australia Dental Association (ADA) has shown that around 50% of Australian children experience some form of dental injury and that about one-third of injuries to teeth are sport related. A well fitted mouthguard can help protect against impact injuries by acting as a shock absorber. The ADA recommends wearing a mouthguard any time there is a risk of impact to the face, both during a match and in training. A custom fitted mouthguard made from an accurate plaster mold of your teeth by a dental professional provides the best fit and therefore the most effective absorption of any impact forces to the teeth or jaw. A further benefit of a custom mouthguard is it will be much more comfortable to wear, meaning its possible to talk with it in and also increasing the likelihood of it being worn for the entire match or training session. For further information follow this link to Sports Medicine Australia. Dentures are devices used to fill in the gaps created by missing teeth. Missing teeth are common among adults and elderly people, and can be caused by various things such as decay, periodontal disease, inadequate oral hygiene, or accidents caused by sport or other injury. Dentures are used to restore the function of your jaw, and your appearance. Dentures are comprised of a plate, metal or acrylic, designed to fit over the bone and soft tissues of your jaw. Ceramic or acrylic false teeth are attached to the plate, matching any remaining teeth to create as natural a look as possible. Are dentures the right treatment for me? Your dentist will examine your jaw and any remaining teeth, and discuss restoration options with you. If dentures are decided upon, your dentist will custom build them for you over a series of appointments. Depending on the severity of your case, your dentist will either create partial dentures in the case of only a few missing teeth, or complete dentures to replace a full set of missing teeth. Dentures are removable and easy to clean. The false teeth will discolour like regular teeth, so proper dental care at home and regular check-ups will be necessary to adequately take care of your dentures. During each dental examination, Toothkind dentists look for signs of changes in your soft tissues such as tongue, floor of mouth, lips and cheeks, which may put you at risk of cancerous changes in the future. The aim of the check is to discover any signs of cancer in your mouth early, so that medical treatment can begin as soon as possible. If you have any unusual lumps or lesions in your mouth that have been there for more than two weeks, or you have had difficulty swallowing for this time, alert your dentist so that a more thorough examination can be undertaken. We would then refer you to a specialist who may take a biopsy for further testing. It is difficult to properly clean the fissures in your teeth, particularly in the back molars and decay can set in leading to cavities. Fissure sealants are designed to fill in the pits and grooves in your teeth to help protect them from plaque and decay. Sealants are quick, painless, and easy to apply. They are made of a white plastic material, which flows into the fissures and is set using a special blue dental light. Once set, they cannot be seen when you talk or smile. Sealants can last for several years before wearing out, and regular dentist check-ups will make sure they are in good condition. Sealants are ideal for children and teenagers, as fissure decay can begin as soon as the back teeth grow. However, adults can also benefit from protective sealants. Nitrous oxide, more commonly known as happy gas, is a very popular method of managing anxiety and stress in patients. You are not made unconscious for the procedure, but rather inhale the gas and become very relaxed. Happy gas is popular as it only takes approximately 5 minutes to take effect, and has a short recovery time. You will remember very little of the entire procedure and there is no after effect, so you are able to carry on with your daily activities, even drive shortly after procedures. For more information, please phone our lovely receptionists. OSA is more than just snoring—it occurs when your airway is partially or even fully blocked, causing uncomfortable muscle spasms as your brain does not receive enough oxygen. OSA is characterised by frequent and loud snoring with episodes of silence and then gasps for breath. It causes restless sleep, headaches in the morning, undue drowsiness during the day, mood swings, poor concentration, and a lack of libido. You will find yourself waking up tired in the morning, and overcome with lethargy throughout the day to the point of falling asleep at inappropriate moments. You may have trouble falling asleep or staying asleep at night. You may also wake often during the night to use the toilet. Treating OSA will benefit your overall health and allow you to have a restful night’s sleep. You’ll wake up with energy and greater concentration, improving work performance and social interaction. OSA treatment can also reduce your risk of heart disease and high blood pressure problems. Left untreated, OSA can have potentially severe physical and interpersonal results. OSA is a serious condition, so it is important that a sleep study confirms whether you suffer from OSA and how severe it is. Your GP can refer you for a sleep study based on your symptoms. If your OSA is mild to moderate as confirmed by a sleep study, your dentist can prescribe oral appliances to wear at night. These appliances work by keeping your lower jaw forward, and stopping the tissues at the back of the tongue and throat from collapsing and blocking your airway. These appliances are custom made by your dentist. They can be adjustable or non-adjustable, and are generally comfortable. The appliances should be used in conjunction with other methods of treatment, such as weight loss, an increase in exercise, or changing your sleeping position. There are minimal side effects, such as minor drooling, jaw tenderness, or temporary change to your bite, but these will disappear with persistent use. The temporomandibular joint or TMJ describes the two joints near the front of your ears where the upper and lower jaws connect. Damage occurs to the TMJ when the disc in the join slips out of position. This will often cause pain, jaw locking or a clicking/grating noise when you open and close your mouth. It may even change the way your teeth bite together. 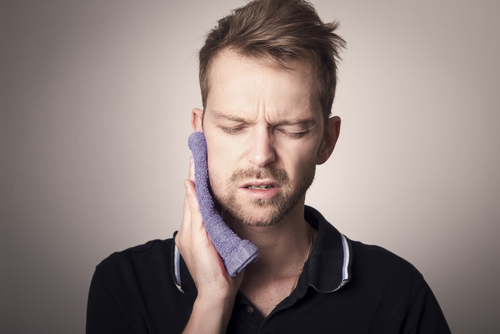 TMJ damage may result from clenching your jaw excessively or grinding your teeth, usually at night. It may also be a consequence of breathing disturbances, sleep apnoea, arthritis or injuries to the head and neck region. TMJ disorders can be associated with otherwise unexplained facial pain, headaches, dizziness, tinnitus and neck and back pain. A combination of these symptoms is often referred to as TMJ dysfunction (or TMD). You may be at risk of TMD if you often wake up with sore/stiff muscles around your jaw, have frequent headaches or neck/back aches, clench your jaw often due to stress, find it difficult to open your mouth wide, suffer from sleep disturbances, arthritis, or have sensitive and severely worn teeth. TMJ treatments will vary greatly depending on your case. Your Toothkind dentist will examine you and suggest the best treatment for you. If you’re ready to take the next step in caring for your smile, call (07) 3269 0655.